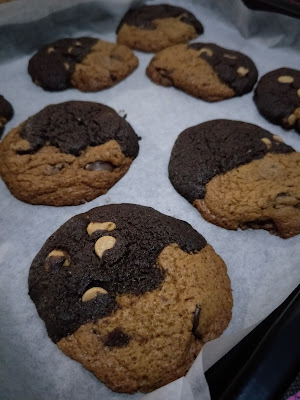 As I've mentioned before in my previous ban ban cookie recipe post (HERE), the flavour of matcha and chocolate didn't seem to go that well with each other, hence I've decided to switch up the recipe a bit and got these instead. 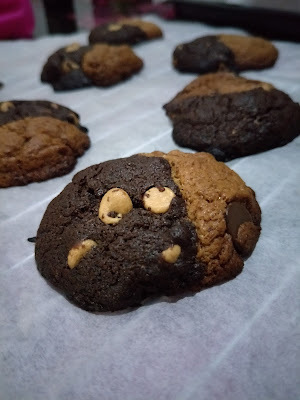 Choco-Peanut Butter half half cookies! So let's get over the ingredients so we can get started! First up, melt your bittersweet chocolate over a double boiler and set it aside to cool down. Cream your butter and sugars until pale and fluffy. Stir in the cooled melted chocolate and mix well. Add in the egg and vanilla extract and mix well. Sift in dry ingredients (very important to sift cocoa powder) and fold until almost thoroughly combined before adding in peanut butter chips and folding until just combined. Never over-mix your batter. Then, keep your batter in the fridge for at least 20 to 30 minutes while you prepare your peanut butter dough. For this dough, it's a super quick and easy 1 bowl recipe. Firstly, stir in the sugar with the peanut butter until well combined, before beating in the egg. Then, fold in your dry ingredients and lastly, the chocolate chips. Using a 1/2 tbsp, scoop 1 spoonful of each of your dough and drop them beside each other (touching) on your prepared baking sheet. Do remember to space out your cookies at least 2 inches apart because they do spread out, a lot. Then, with slightly oiled hands (your peanut butter dough should help you with that) carefully mold the two flavoured doughs together into a ball and press them down slightly. If you'll prefer flat and thin cookies, send them straight into the oven to bake at 175 degree Celsius for about 18 minutes. Each oven bakes differently hence do keep a watchful eye on your cookies, especially at the initial part (for they may spread gloriously into each other) and towards the end (so they do not burn). 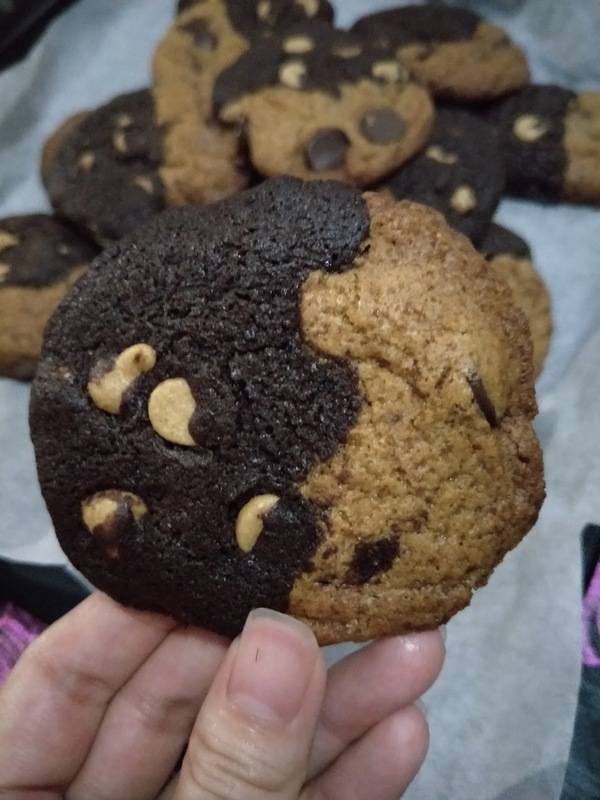 If you find your cookies getting dangerously close towards each other, you may crank up your temperature to 190 degree Celsius to "set" the cookie edges first (for perhaps about 5 minutes) before turning your temperature back down to 175 degree Celsius. Big and flat ban ban cookies from doughs that were sent straight into the oven. However, if you prefer a slightly dome-shaped cookie, pop your dropped cookie doughs into the freezer for at least 10 minutes to harden up before popping the chilled dough straight into the oven. You can either tweak the temperature slightly (I baked at 180 degree Celsius for 10 minutes and then 170 degree Celsius for another 10 minutes), or bake them for an additional 1 or 2 minutes at the same temperature. Slightly smaller and fatter cookies from doughs that were frozen for 10 minutes before baking. I have to say, peanut butter and chocolate just complement each other so well! These cookies will be extremely soft and feels spongey/cakey when first removed from the oven, so remember to not disturb them and let them cool completely to harden up. The outsides are slightly crisp and the insides chewy, filled with decadent sweetness of the chocolate and complemented with buttery, nutty fragrance of the peanut butter. What a great idea of mixing two of your favorites half'n'half together! I'm sure these were delicious. I wish I would be better with cooking cookies (and I wish they'd be more healthy haha!). Thanks for sharing! These cookies sound delicious.With half and half,I am sure the flavour combination goes together.And of course,cant forget the flavour of choco in any cookie.Peanut butter is always a winner of hearts! I missed baking! I used to bake cookies all the time hehe. I will definitely try and make these some time this month. YUM!! !